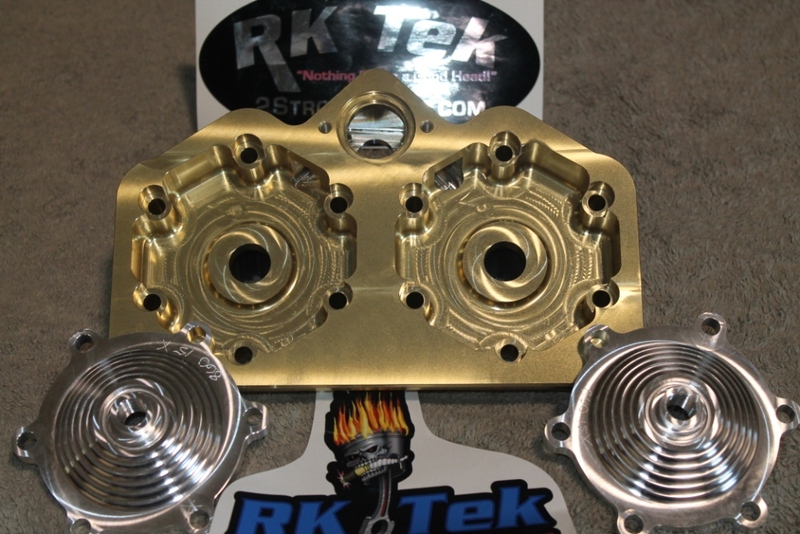 The RK Tek Combustion Chamber design is unique enough to be patented..and IS PATENTED! For those of you who are un-happy with the fuel economy (or lack of it) with your Series III Engines.. Adding the head, ALONE, will allow for MUCH leaner jetting thus greatly increasing fuel mileage!! For example... 2001 800 Twin.. Stock = 500 main jet.. Installing the head, ONLY, you will run a 420 main jet!! Can you say " MORE FUEL ECONOMY??"? After installing the Torque-Line Head, the engine would continue to pull when the stock engine would power out. The difference was HUGE when hill climbing. We took the extra time and put a very nice finishing touch on the design. This included inner and outer radii, hose relief, and stock locating of temperature sensor. All heads are bright clear anodized, or color anodized for added protection against the elements. Special colors can be made with the proper notice. All of our testing is done "real world" we do NOT give false dyno reports, we test "real world" which we feel is the only testing that is worth anything.